The Center for Independence of the Disabled, New York (CIDNY for short) was honored with a proclamation from NYC Council for our 40th anniversary today. It was presented by Speaker Corey Johnson, who thanked us for our advocacy by and for people with disabilities. He said that the City “needs to do better” to reduce barriers and make the city more accessible. We are grateful for the recognition of our efforts and our history as the first independent living center in New York. And we agree that our work is far from over. You can see the proclamation in our Manhattan office. 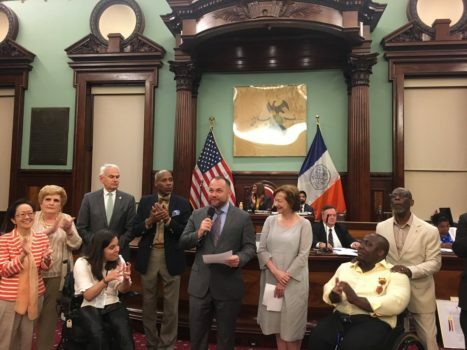 BE IT KNOWN: That the New York City Council is proud to honor the Center for Independence of the Disabled, New York in celebration of its 40TH ANNIVERSARY and for its extraordinary service to people with disabilities throughout New York City’s five boroughs and beyond. Signed this 18th day of July in the year Twenty Eighteen.